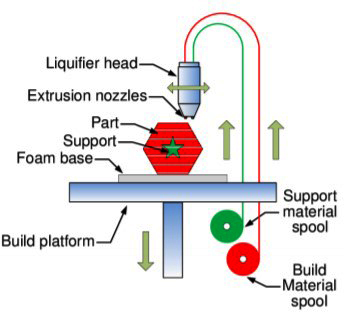 Figure 1: Material extrusion processThe layers are positioned from bottom to top in AM-ME process. For example, the first layer in Figure 2 (a) is built as nozzle deposits material where required onto the cross-sectional area of the cylinder. The following layers are added on top of previous layers. Layers are fused together upon deposition as the material is in a melted state. Figure 2 (b) shows a top view of the last layer which is layer 4. The top view shows how the nozzle had moved during the process, and how the toolpath creates voids. This process is independent of material in AM-ME. The next section explains types of material in AM-ME and names some of them in industry. 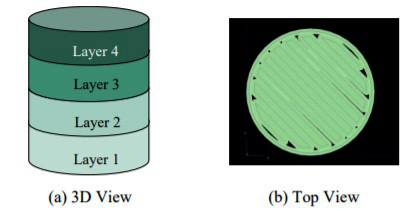 Figure 2: (a) A four-layer cylinder, (b) Top view of the cylinderThere are two types of material in the AM-ME process which are the build material and support material. As it shows, for producing Figure 3 (a), the build material, red part of Figure 3 (b), and the support material, gray part of Figure 3 (c), are used during the process. In the end, the support material is needed to remove from Figure 3 (c) to get Figure 3 (a). This entry was posted in Additive Manufacturing, Manufacture, Materials, Microstructure, Sintering and tagged 3d printing, Additive Manufacturing. Bookmark the permalink.